Why Does the Kangaroo Have a Pouch? Marsupials are a group of mammals that give birth to small, partially developed young that crawl into a pouch on their mothers belly to complete the rest of their growth before they venture out of this pouch and fend for themselves. But, why do marsupials have pouches? What advantage does this give them? We’re going to refer to the kangaroo as our primary example. The partially developed joey (baby kangaroo) leaves its mothers womb and crawls into the pouch, to finish growing into something more like a mature kangaroo. Why does the kangaroo do this? Here is a theory that I developed to solve this puzzling “kangaroo question”. 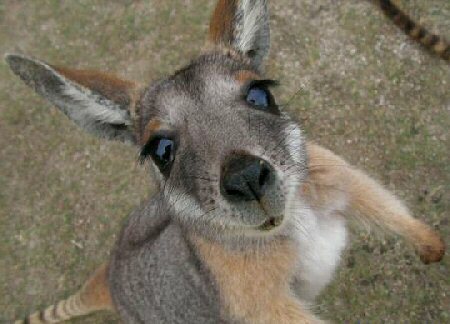 Ok, so we have this mommy kangaroo, hopping through the semi-desert called Australia. She is already expending energy just through its pregnancy. She has a lot of predators, who would be happy to gobble her up in a heartbeat. She must be fast and have lots of energy, which she has to constantly forage to get enough of. Imagine that she had to stop foraging for her food, and had to try to hide and stop somewhere to give birth to a joey? She would still be knocked out by this birth, and would be immediately vulnerable to predators. Her chances of survival are thus greatly increased by not having to stop moving, foraging, and looking out for hungry predators by having an easy birth with a small joey, which then grows to maturity outside its mothers body in the relative safety of the pouch. So, to boil down the question and my proposed answer; first, why would the mother kangaroo (or any marsupial) not give birth to fully developed offspring? The proposed answer is as follows; if the female kangaroo had to stop and hide to give birth, first of all she’d be using a ton of energy to give birth, and then she’d be weak and tired for a few days. She’d be easy prey, and so she has an easy birth by having the joey leave her body when it is still small, and travel into the pouch where it can finish developing. By doing this, it never has to truly give birth like most other mammals. ← Size of a Political Body: Is Bigger Safer?